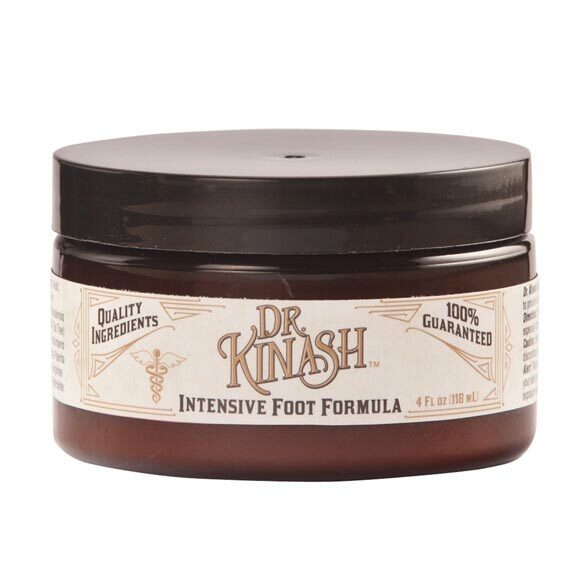 Dr. Kinash™ Intensive Foot Formula helps transform dry, cracked feet into smooth, healthy skin you’ll be proud to bare. Dr. Kinash™ science-based formulations and ingredients are trusted remedies with guaranteed results. Intensive foot cream quickly absorbs and instantly moisturizes even the hardest, toughest skin, helping to prevent splits and cracks that can lead to infection. Tried-and-true remedy for dry, cracked skin. Absorbs quickly to instantly soothe and soften. 100% safe for use between the toes. Free of alcohol, fragrance, dyes and petroleum. Massage cracked heels treatment into feet twice daily, focusing on heels. Water (Aqua), Urea, Lanolin, Lactic Acid, Glyceryl Stearate, PEG-100 Stearate, Ammonium Acryloyldimethyltaurate/VP Copolymer, Aloe Barbadensis Leaf Juice, Ceteareth-20, Melaleuca Alternifolia (Tea Tree) Leaf Oil, Eucalyptus Globulus Oil, Gaultheria Procumbens (Wintergreen) Leaf Oil, Propylene Glycol, Mentha Piperita (Peppermint) Oil, Silk Amino Acid, Ubiquinone, Argine HCI, Sodium Hydroxymethylglycinate, Sodium Hydroxide. Generously massage into all surfaces of the feet, especially the heels, twice daily. Use only as directed. If skin irritation or rash occurs, discontinue use immediately. Avoid contact with eyes. Sunburn Alert: This product contains Alpha Hydroxy Acids that can increase your skin's sensitivity to sunlight. Use a sunscreen and limit sun exposure while using this product and for 2 weeks afterward. I want to try it. It looks promising, to help soothe and soften my feet. I have very bony feet that have caused me to develop callouses. It is the only product that seems to work on my husbands feet. After foot surgery and in a cast for 6 weeks my feet are a mess and need attention. I am always looking for good foot products - decided to give this a try. I'm a diabetic and I want to take care of my feet, so I hoping this product will be good for this! The feet are so important and sometimes we forget to take better care of them. Have used many other products to obtain softer feet. I am gamed to try this. MY FEET NEED HELP! need it for my feet hope it works like the pictures says.